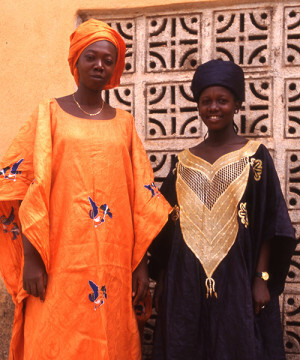 In 1998, Janet’s friend Mme Mama Traore told Janet that she wanted to start a small fabric dyeing business. Mama had some business experience and some experience with the dye process. 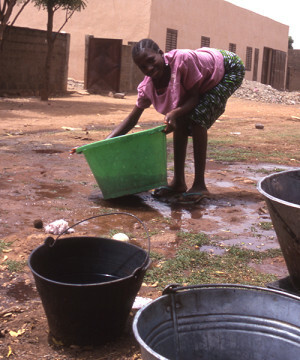 She had recently completed a course at a local women’s center in Bamako but Mama lacked the money to buy the initial materials. Janet and Mama talked for a long time over many days about Mama’s plans and needs and how they thought Janet might be able to help. 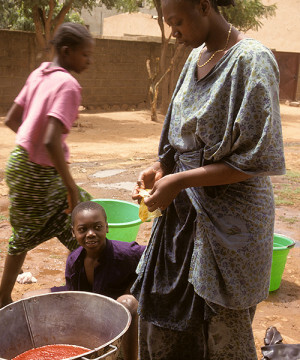 Micro-credit is available for women’s businesses in Mali but in order to qualify women need to work with a group. Mama wanted to start her own business by herself. During their discussions, Janet came up with a plan to raise the money she needed privately by appealing to friends and colleagues who knew of Janet’s connection to Mali and were sympathetic to women’s issues as well as the difficulty of starting a small business. 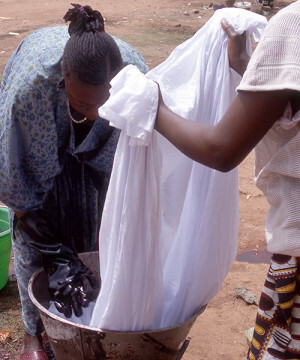 For a $50 contribution, they offered a couple of yards of the dyed cloth or a shirt made out of the dyed cloth. The appeal was successful and Mme Traore is still in business.